There are times that you really just need a cupcake. However, the problem there is that you have to mix up a whole batch and cook several rounds in the oven. Doing that seems to take an eternity. Well instead of putting yourself through all of that nonsense, now you can make up a batch of cupcakes in mere minutes. 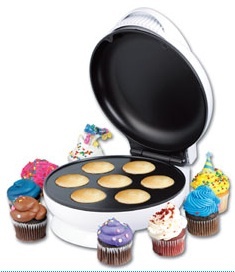 Life couldn’t possibly get any better than having a device to give you fresh cupcakes and fast. Of course these are miniature cupcakes, they’re not quite full sized. It gives a total of 7 though, so it should be enough to keep you happy. Then if you need more, you can just make another batch of them. The clean up will take not time at all thanks to some handy non-stick surfaces, so you can make batch after batch without much effort. Thankfully these are a little cheaper than they originally were. You can pick one up for $33 through What On Earth. Where can you find this – it looks like it is sold out everywhere right now?? ?